Click here to enter the contest and learn more about good pillows. (Richmond, VA) – After years of hearing about the terrible pillows people are trying (in most cases unsuccessfully) to use for sleep, the world’s largest maker of comfort cushion products is fed up. 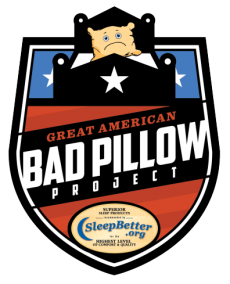 To combat this growing problem, Carpenter Co. and SleepBetter.org are launching the Great American Bad Pillow Project. The program will provide a one-stop location for learning about what makes a good pillow, how to choose a new one and how consumers can take care of the pillows they have. Having the right pillow, and having one that isn’t old and gross, isn’t just a comfort issue. It’s a medical one, according to Dr. Neil Kline from the American Sleep Association. Carpenter Co. has set up what it calls the “Pillow Education Hub” on its SleepBetter.org website. To encourage individuals to visit the website and learn about good pillows and good sleep hygiene, the company is also launching the Great American Bad Pillow Project Contest, which begins on August 1. At the end of the contest period, on September 1, three winners will receive a bedding makeover package from Carpenter Co. that includes two Serene™ Foam pillows, one Beyond Down® comforter, one Serene™ Foam “Bed in a Box” 10-inch mattress, and one Iso•Cool® mattress topper. Carpenter Co. is the largest manufacturer of comfort cushioning products in the world. The Richmond, Va.-based company manufactures a wide variety of polyurethane foam and polyester fiber products, all designed to make the world more comfortable. Born and built in the United States, Carpenter Co. has a 65-year history of designing the world’s most comfortable products and remains on the cutting edge of product development, creating innovative products that improve sleep and enhance active lifestyles. The Carpenter Co. Consumer Products Division offers a dynamic line of trusted products, including Isotonic®, ErgoFresh™, Ambient™ and Iso•Cool® by Isotonic® pillows, mattress pads and neck pillows as well as comfort technologies like Avena™ and Avela™ and new technologies like IsoFresh™. For more information, visit www.carpenter.com.